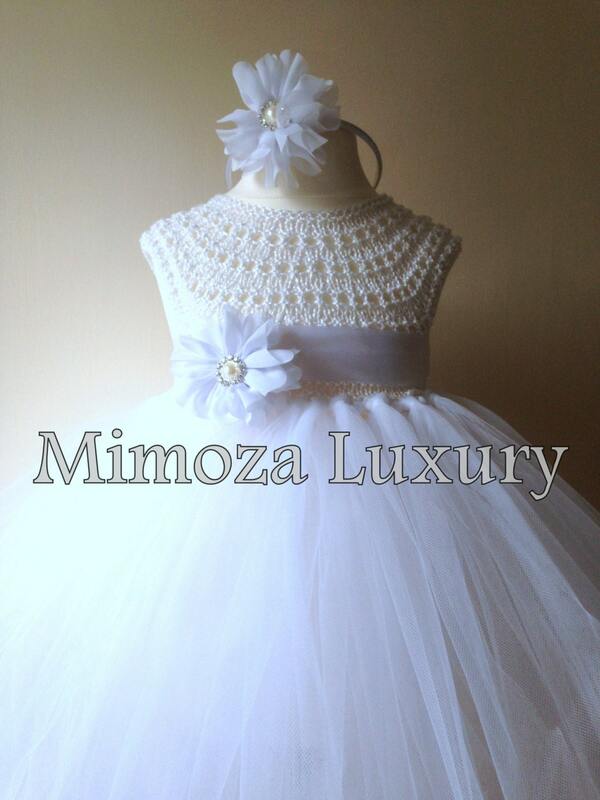 Lovely and Unique Handmade Dress, perfect for your special birthday party, wedding, christening or special occasion! 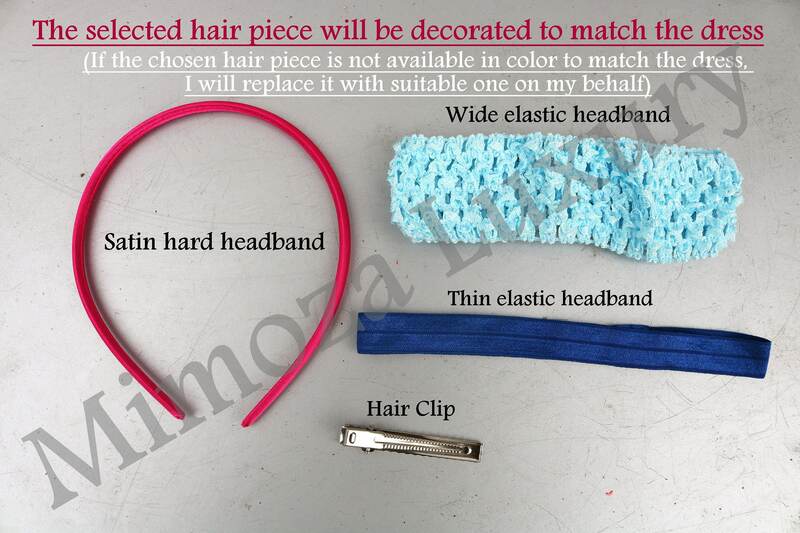 The flower sash and the head piece of you choice are included! 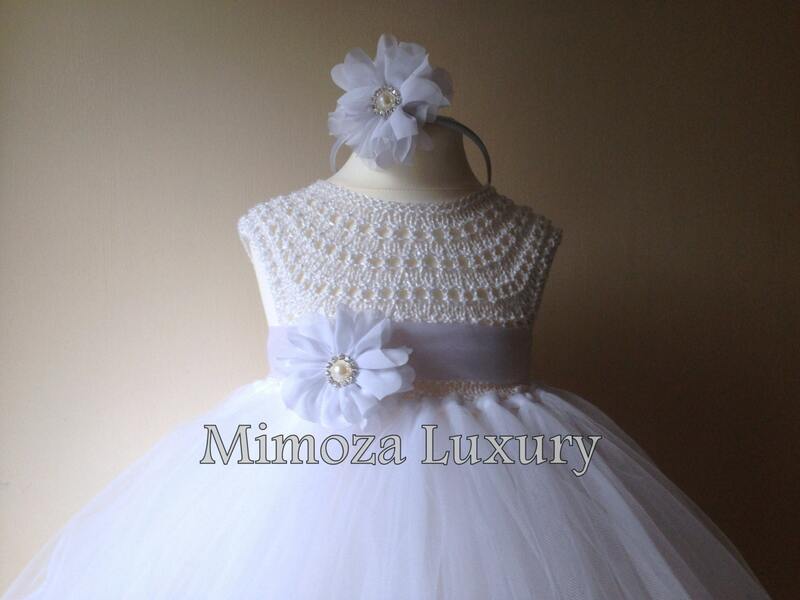 The dress is made to order with lots of love by Mimoza Luxury designer. The dress can be customized to meet your requirements (if possible), just send me a message! The dress bodice is hand knitted with high quality silk/cotton yarn, it feels lovely on the skin when wearing. The skirt is very fluffy made with hundreds of yards soft tulle. Our dresses are Unique on the market and only Mimoza Luxury creates the original design. Be aware that you can meet some other copies of our designs, but the difference in the quality is huge. 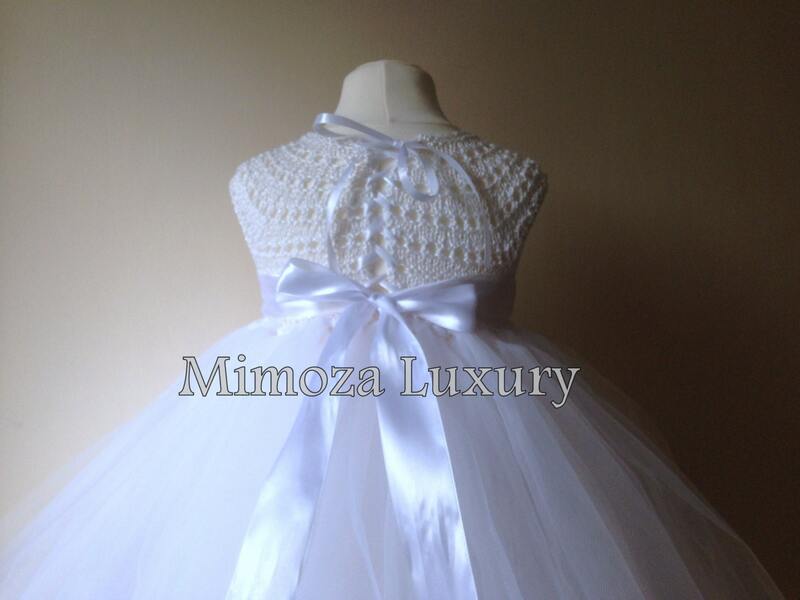 Only our dress bodice is Hand Knitted in original Mimoza Luxury pattern, which provides lots of stretch in the bodice and ensure great fit with lots of comfort. Rather than all the others which are crocheted and the result is no stretch and poor fit. Be Unique, Choose the Quality! The dress can be made in All Sizes! The turn around time is different for each dress (usually 1-2 weeks, but can be more or less), so please message me or include in the notes the date you require the dress to be delivered, so I can ensure that is made and delivered on time. In case it's not possible, be sure that I will contact you to notify for that and to decide how to proceed with your order. 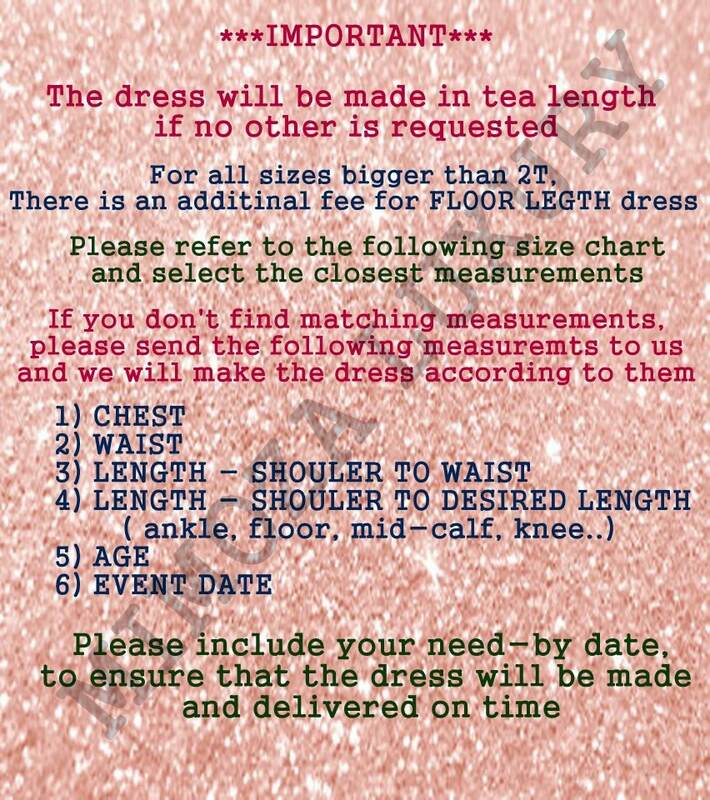 The length of our dresses is usually made in mid-calf (tea) length, if no other is requested! 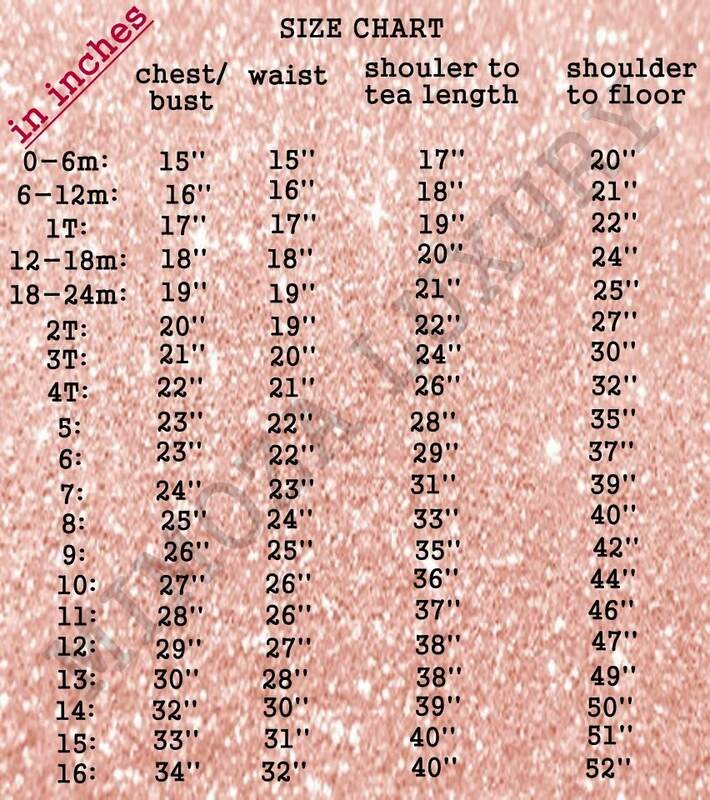 If you prefer different length, just send me a message or include in the notes during the checkout the length, measured from the shoulder down to desired length and I will make it! This dress is made to order! The sizing on all our dresses is fairly versatile due to the stretch of the hand knitted top in the chest and waist, adjustable back with ribbon and removable waistband, but for the best fit, we recommend you to measure your child. Please refer to the size chart in the photos and select the closest! Each dress can be made in other color combination of your choice, just drop me a message! Thank you for choosing our Unique Designs!